We put private data in our android phones and tablets. These data not always contain any document or app which can be locked by using locker apps like AppLock. Sometimes these contains some pictures and videos too. We can’t lock our gallery app , photo-viewer or media player apps because it will then lock the app for every photo and video. So, we have a smarter app to deal with the problem. 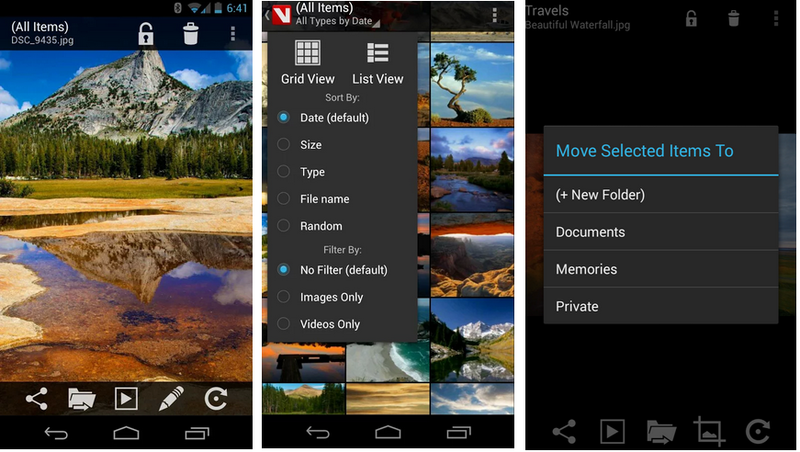 The app is called Vaulty which can selectively hide your photos and videos and lock it in its protected vault. 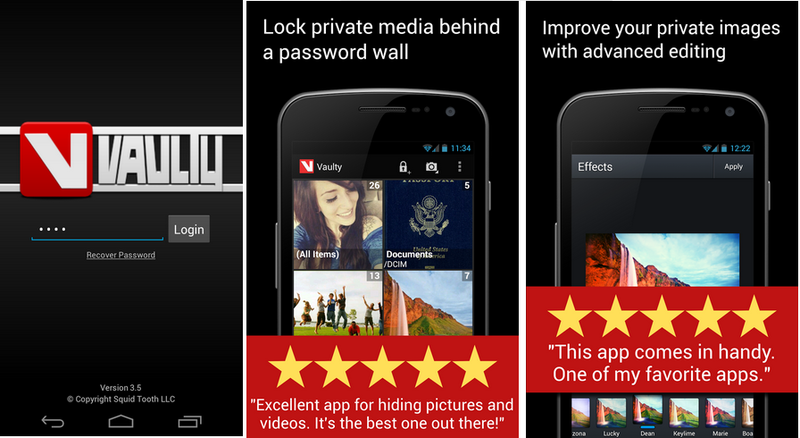 Available for android, Vaulty is a free app that allow you to set text or number password to its vault where you can send images or videos to keep private, locked and password protected from pyring eyes. Just download vaulty from the Google Play, install it, assign password (text/number), enter your own security own security question and its answer and you’re ready to hide your private photos and videos. So, you can now prevent to accidentally show too much at your gallery and feel safe when your phone is on your friend’s hand, co-workers and relatives knowing that your private data is safe. Not only this vaulty lock but there are several other features which you’ll love about the app. Inside Vaulty chest, you’ll have all your photos and videos that you’ve sent to vaulty, in its private gallery. The app comes with built-in photo viewer and video player which means, you can watch photos and videos inside vaulty chest, without using any other app. The pin code or text password that you set while installing vaulty can be changed. You can remove the password even, if you are in safe environment to watch your private photos or videos. It is a very powerful feature to catch intruder or suspicious people out of your trusted people. If anyone try to access your vaulty and enters a wrong password, Vaulty will catch a picture of them using the front camera and save it inside your vault. Next time, when you login, you can see the picture of intruder who tried to access your vaulty. Well it is a premium service but it is very powerful. You can preserve your phone’s precious memory with an automatic online backup of your hidden pictures & videos. If phone is lost, stolen of broken, Vaulty will restore all your data on your new device. It is another very cool feature that will allow you to create more than one vault. So, you can have different photos and videos in different vaults having different passwords. 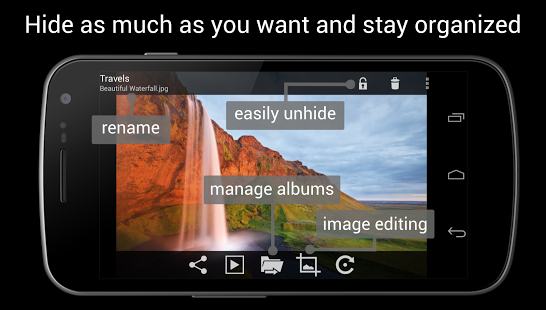 It is a great way to organize pictures and videos or let someone view only some of what you’re hiding. Moving photos and videos to vault is very easy. All you need to do is just select your photos and videos, tap share button and choose vaulty. You don’t need to enter password for your vaulty which moving in any photo or video. Moving out is also very easy. When you’re inside vaulty, open a photo/video and click on the lock button provided above and the photo/video will be moved back to the location from where you’ve taken it. You can edit photos inside vaulty using its built-in photo editor that has lots of filters and effects to provide your photos from basic to advanced retouching. Moreover, you can share photos/videos directly from vaulty, click photos from its private camera, create & organize albums or folders, sort by date, name, size or type and more. Download Hide Pictures in Vaulty from the Google Play Store.